Crescent Moon Collective: Why so many Washcloths? 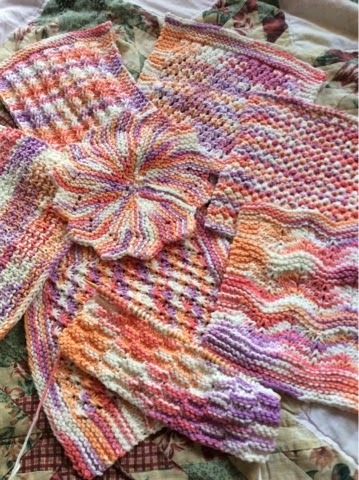 I don't know the answer to my question, but I can tell you I have made 8 washcloths in the past week. It all started because I saw a pretty pattern on Ravelry, and reached for a skein of cotton I had in the stash. The skein happened to be 340 g or 12 oz, which makes for an awful lot of dishcloths. Once started there is no turning back! I think I will get to the end of this skein today, The crazy thing is I just happen to have a second MonsterBall of cotton waiting on the sideline taunting me. Somehow, one just leads to another one, and so on, and so on. It is easy knitting, usually only taking a few rows to memorize the pattern, and then, easy mindless knitting. I did sign up in a type of lottery on Ravelry, where each month a group of people each make a dishcloth, and at the end of the month, one person wins them all, and we all send her the one we made. Who knew there was such a social aspect to dishcloths? You can see the details of all my knitting projects on Ravelry, here in my Projects Page. Currently there are 178 projects, 165 of them completed. I like to keep track of the details online, so have listed yarn, needle size, start and finished dates and of course, the links to the patterns. The Projects Pages might be my favourite part of Ravelry.com, and is very helpful in keeping me organized. 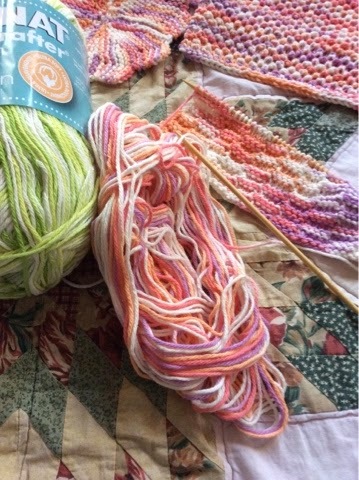 I do have other W.I.Ps to knit on; shawls and socks, gloves and bags, however this week it is all about the face cloths. Oh yes, these are for faces, not dishes. I am trying out as many different patterns as I can, to see which I deem to be the best. I have to take into consideration which are the best to knit, and of course the best to actually use. There are over 10,000 dishcloth patterns listed on Ravelry. Trust me, I will not be testing them all! There is a new pattern forming in my mind, (not a dishcloth) but you will have to wait a bit to hear about that.